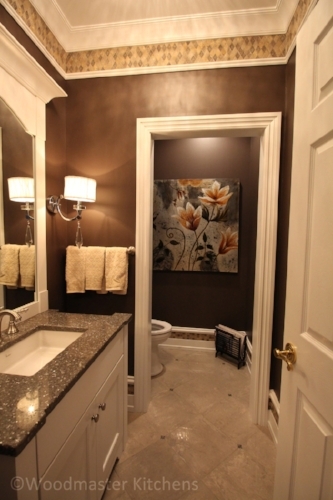 Bathrooms are an integral part of the home, and more than just a place to brush your teeth and shower. They are often a retreat designed for relaxation or a focal point for your busy morning with space to get ready and prepare for the day ahead. Design styles have evolved over time to reflect the role of today’s bathroom, and often include furniture, lighting, and color schemes worthy of any space in your home. Why not bring a sophisticated, yet fun, edge to your bathroom design by adding some glamorous details to create a luxurious environment? 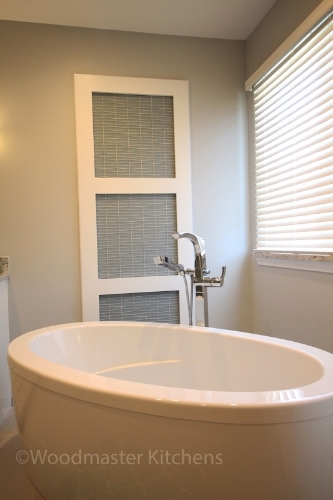 There are a number of ways to incorporate glamor into your bathroom design. Create a lavish space worthy of a Hollywood star with a complete bathroom makeover, or just give your new bathroom a bit of sparkle with some glam details. 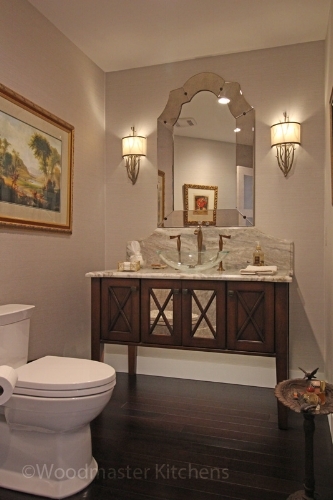 Like your favorite jewels, the accessories and details you include in your bathroom add sparkle to the room. They should enhance your surroundings without overpowering it. Include a dramatic mirror, mirrored surfaces, glass mosaic tiles, polished metal, and other sparkling details to give your bathroom a dramatic edge. 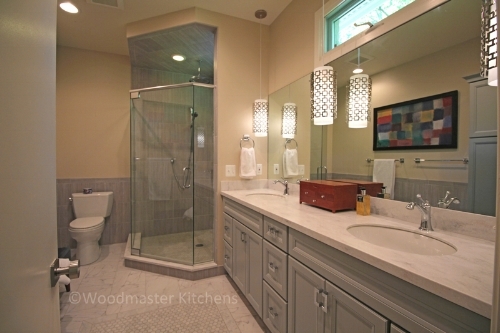 The bathroom design in Farmington Hills pictured below left includes a large, elegant mirror that serves a practical purpose but also brings sophistication to the design. Mirrored surfaces and glass details can have a striking effect in both large and small bathrooms. The powder room below right adds shine to the small space, including a stylish mirror, a glass vessel sink, and a mirrored surface on the furniture style cabinetry. Color schemes, materials, and textures create a distinct atmosphere in any room. They influence not only the way you see the room, but also your mood when entering the space. For a glamorous setting, make a bold statement with bright jewel tones, dark colors like the design below left, or even an all-white room with sparkling accessories that evokes the aura of your favorite fancy hotel like the design below right. Natural materials like marble and granite bring a feeling of luxury to your bathroom, and sumptuous fabrics or textured tiles enhance the space through sight and feel. All the elements of your bathroom style must work together, but including a focal point can add an extra dramatic flair to the room. 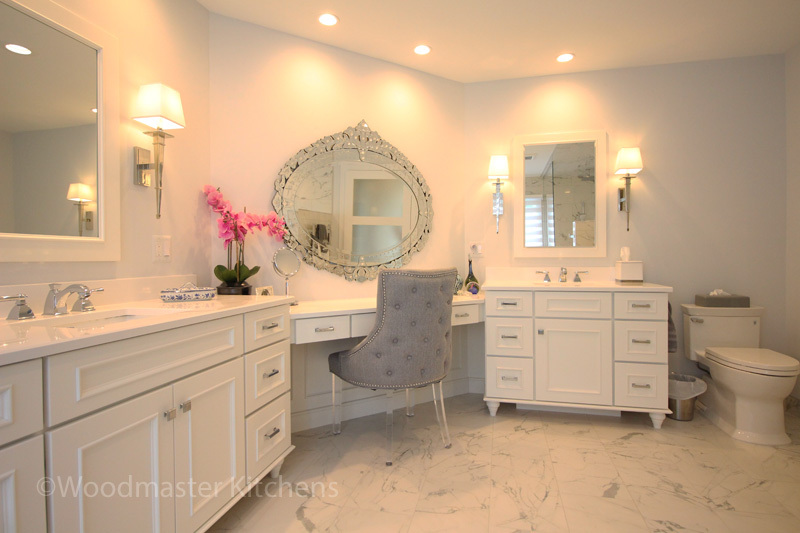 A furniture style vanity like the one below left or a freestanding tub like the design below right are ideal candidates to be the diva of your bathroom design. A unique mirror, a patterned tile design, or an architectural feature can also elevate the sophistication of your space. You could even include a large double vanity with a separate make-up area and a backlit mirror for the full star treatment. 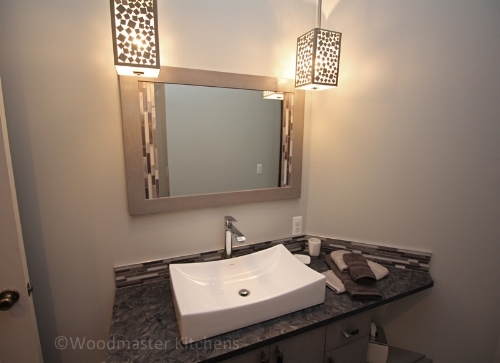 Lighting adds a touch of glamor to your bathroom by highlighting features in your design and providing the perfect illumination to bring out the best in you or any visitor to your bathroom. Some bathroom light fixtures are a glamorous design piece on their own, like a chandelier, an eye-catching lampshade, or crystal sconces. All of these light fixtures are part of a multi-layered lighting design, but also serve as unique decorative elements. The key to creating a glamorous bathroom that will stand the test of time is to aim for classy charm rather than over the top glitz. Pick one or two elements if you want to add a touch of glamor, such as a furniture style vanity or a large mirror with sparkling details. If you want to go all out, select a color scheme and style that suits your personality and home, but add the extra details that make your room sparkle and create a glamorous atmosphere. Visit our design gallery for more bathroom ideas or contact us today to discuss your glamorous bathroom renovation requirements!